At approximately 1:15 AM on 11/20/04 my wife & I retired to sleep on the second level of our Boca Raton, Fl home after watching TV in our first floor den. As I often do, I put on our TV in our room which helps me to get to sleep. As I watched a National Geographic special I became groggy. Knowing that keeping the TV on all night bothers my wife, I grabbed the remote and switched off the TV and quickly fell into a deep sleep. In what seemed an instant after doing so, I was awakened by my wife who questioned me as to where I was. My immediate response was "in our bed." My wife then explained to me that she awoke because she sensed that I was not in bed with her. She then stated that she searched the whole house and even walked to the guard house in her pajamas of our community to see if anybody had been permitted to drive to our residence to pick me up. She was told nobody had come into the community. Upon her return, she burst into the room and found me in our bed. She stated that my car was in our driveway, and that my wallet, cell phone and money was just as I had left it in our kitchen when we went upstairs, which further upset her. She knows me well enough to know that if, in fact, I left our home for some reason, I would have taken these items with me. We do not live near any stores or establishments that one could walk to. As I awoke, she further explained that the covers in our bed on my side looked exactly as if I had pushed them down and left the bed. Realizing that she was not kidding, I informed her that I just turned off the TV and fell asleep. She then reconfirmed that she searched our entire residence and that I was not physically present. I glanced at the clock and it was about 2:30 AM when she stormed into our bedroom and awoke me with this shocking news. I tried to comfort and console her at this point and confirmed that to my knowledge I had not left our bed, not even to use the bathroom. Not really sure what had happened, we went back to bed. 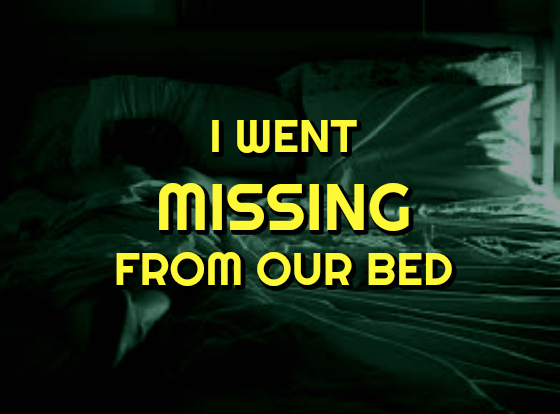 When I awoke, I asked her to confirm what had happened and that either her nor I were dreaming. She confirmed it. Somehow, I do not think either of us actually accepted this event as reality because we awoke and did not talk about it. As a believer, I felt that I needed to let soembody know and help me to understand what might have happened. So I searched the web and found this site to report incidents. I called and was instructed to file this report as I am. I consider myself of sane and sound mind and am a local business owner. I was also instructed to have my wife file an incident report which will be done first in the AM. I am also willing to have this event scrutinized by any means required to validate it including onsite investigation, cameras, lie detectors anything. It almost seems like something out of the 'Twilight Zone' and I feel more confused than anything. I am not sure what really happened. The evidence has it that I was somehow physically missing from my home for 45-60 minutes without my knowledge. I was told to examine myself for any marks, and did not find any. However, from the base of my throat to the middle of my chest it is mildly red, as if I had been exposed to the sun. I can tell because when I press the area, a brief mark appears such as when one gets a sunburn and presses the affected area with a finger. The rest of my body is unaffected. I welcome any comments and or suggestions. This report was submitted by the witness, ((name deleted)). The contact information was given to me by Peter Davenport. I called ((name deleted)) at work on 12-13-04. He said he wanted to talk to me and gave me his home phone number. I called this number many times. Tried the work number again, and attempted e-mail contact. None of the messages were answered. If future attempts at contact are successful, I will notify this site.